Home Enlivening What is Yoga? Most of us are accustomed to looking outside of ourselves for fulfillment. We live in a world that conditions us to believe that our attachments to ‘stuff’ can give us what we want and desire. All the while leaving us with a feeling, and a longing that there is ‘something more’. Yoga is a simple process of reversing the ordinary outward flow of energy and consciousness so that the mind becomes quiet and a connection to the soul becomes apparent. The word yoga itself means ‘union’. Though many people think of yoga as a physical exercise, it is much more than that. Hatha Yoga is a system of physical postures, or asanas, as they are called in sanskrit (an ancient Indian language). The higher purpose of hatha yoga is to purify the body, giving one the sense of awareness and control over the mind, very much like meditation. Yoga is a 5000 year old Indian world of knowledge. It is all about harmonizing the body with the mind, using the breath as a tool. Yoga works for everyone, from people who work at a desk all day, to professional athletes, runners, or for people looking for weight loss, to students and homemakers too. Yoga offers a host of physical and mental benefits. Yoga teachers will often refer to ‘your practice’, which means your individual experience with yoga as it develops over time. The amazing thing about yoga is that your practice is always evolving and changing so it never gets boring. Although the poses themselves do not change, the way your body relates to them will. 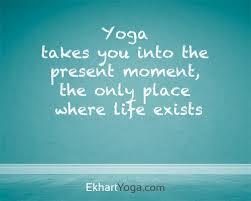 You don’t have to be flexible or strong to practice yoga, the beauty of yoga, these things happen over time. Yoga allows us, during our practice to let go of our Ego, on one is better than anyone else, everyone in the class is just doing their best on any given day. ‘Leave your Ego at the Door’.